Glass Blown Open: April 20-28Get ready for the world’s largest disc golf tournament, held right here in Emporia. Planning a meeting or event?See why Emporia is the perfect host! More to DoSee the full list of everything to do in and around Emporia. The Emporia Convention & Visitors Bureau (CVB) welcomes visitors and meeting planners, and serves as the visitor information center for Emporia, Kansas and surrounding area. The 2018 holiday season in Emporia officially begins tonight – Tuesday, November 20 with the Happy Holidaze lighting at David Traylor Zoo, 75 Sodens Road. This annual event illuminates Emporia’s beautiful zoo with thousands of lights, turning it into a favorite destination during the holidays. The Emporia Friends of the Zoo invite guests to join in the Happy Holidaze festivities beginning at 5 p.m. Guests should enter the zoo at the main entrance and make their way through the zoo to the hoof stock area on Zoo Road. The countdown to the big lighting ceremony begins at dusk (around 5:45p.m.). Special guests Rick &Staci Hamman and their grandchildren Taylah and Holden will be flipping the switch to light up the zoo this year. That experience was purchased at the EFOZ fundraising auction earlier in the year. Before the more than 50,000 lights turn on for the season, guests can stroll the zoo and enjoy a variety of activities set up among the animal habitats. Docents will have reindeer games for the kids, the Emporia High Chorale will be singing holiday tunes and hot chocolate will be available for a donation, served by the EFOZ Board of Directors. As you enjoy the activities, be on the lookout for special visitors from the North Pole who will have treats for the kids! Several photo opportunities set up around the zoo make for some great social media memories, and you will definitely want to take photos after the lights come on. The observation deck by the duck pond is especially beautiful as it reflects the thousands of lights draped in the trees surrounding the water. Don’t forget your camera! Once the switch is flipped, the lights will come on around 6 – 11 p.m. each day through January 1. Be sure to add this gorgeous display to your Christmas light viewing route! Thank you for your interest in meetings and events! Get your FREE Visitors Guide! 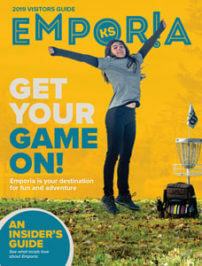 Want to stay up date on Emporia news, things to do and travel tips? Enter your email and get our blog articles delivered to your inbox!